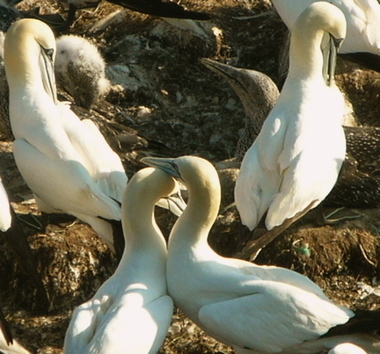 These are gannets at St. Mary’s Ecological Reserve. The dark birds are the young, by now as large as their parents. The one with the fuzzy head is even younger than the one with a smooth head. All this has nothing to do with gardens or with the post below, except that Chris works with these birds, and told me about the garden. In the post below. 1) Our B&B host at the extreme southern tip of the island kept saying, “Best place in the world.” That much I got right. But where I implied that he was referring to all Newfoundland, it’s become pretty clear that he had something much more specific in mind: his home town, Branch. I’ve got two pretty good pieces of evidence to support this claim. Chris and Priscilla continue to astonish me. While Chris was in university in St. John’s, the capital of Newfoundland and Labrador, he courted a girl he’d known all his life, and married her. He eventually pried her loose from the university after she’d racked up three post-graduate degrees, returned to his home-town of several hundred inhabitants, and got a job in his field of wildlife management. I call that success. I also call it amazing. As for Priscilla, apparently she sorted through her various degrees, picked social work, and got a job in that field in the biggish town forty-five minutes up the coast. Then they built and opened the B&B. “It pays for her student loans,” he told me. Was that his tongue in his cheek? I’m not sure. 2) I was sure that Priscilla would know why the garden trenches went up and down hill, instead of being dug across the slope. Wrong again. She had no idea. “The garden was my idea,” she explained, “and then Chris and his dad did all the work.” I had to laugh with her. Everyone down in the village had told her that nothing would grow way up on their hill (the place isn’t called The Cliff House for nothing), that there wouldn’t be enough sunshine, but her broccoli and cabbages proved them wrong. The one squash had never done well, though, and the lettuce in the first row had also been sickly and eventually died off. We shrugged, wondering why. When I asked if she’d considered composting her household garbage, she leaned towards me with an almost covert excitement. As mayor, she said, she wanted to bring in an expert to talk to the townspeople about composting and recycling, “to promote how important this is, you know?” Then, the government (or an institution?) would actually provide composters for each household. Her glow, describing these composters, rivaled the enthusiasm other women might show as they described a necklace. I love it. “You would say ‘thick,’ but I say ‘tick,’ and I always will.” Apparently, if he ever started saying “thick,” he’d have to renounce his Newfoundland citizenship. Why should he change how he talked? People adjusted; the photographer who stayed with them for seven weeks left talking just like him, he asserted. “Poor woman,” Steve ragged him. So much for that theory of mine. Then I asked why the garden was off a ways from the house. Drainage? Again I stared. The fellow must think me tick in the head. This time I laughed outright, thinking of the pictures I’d taken and posted to show how stony the soil was, there in the garden. “No, this is like beach stones here,” he said, pointing out the window at his “yard” and referring to the many beaches covered with stones rather than sand. I was still gaping, but he’d gone on to explain that he’d fertilized the garden with seaweed, composting it over the winter, then sandwiching a layer between layers of dirt. Well, seaweed was best, I agreed. I had to buy mine, though. Chris said that in the old days, every yard would have a big pile of seaweed in the fall, composting for spring. Now, Priscilla told me, others grew potatoes in their back yards, but little else. On reflection, I’m wondering whether lettuce and squash couldn’t tolerate the salt in seaweed, or simply the soil pH. Something to research. I went off to watch gannets, reflecting that being set right by these folks was such a pleasure, I didn’t mind getting things wrong to begin with. So I love your blog, so left you an award over at my blog. If you aren’t a meme type of person, feel free to ignore it. Thank you, Daphne! I’ll pick it up asap.